Doha-based Qatar Airways has been named the top airline in the world in 2017 by the Skytrax World Airline Awards. The carrier took the award away from Emirates, the winner in 2016. This year's winners were determined via a passenger survey. New to the list in 2017 are Hainan and Garuda, which displaced Turkish Airlines and Qantas. With this year's award, Qatar Airways has won the Best Airline award for the fourth time, lauded for offering its bespoke five-star service to 140 cities in Europe, Middle East, Africa, Asia, North America and South America. The airline also won in the categories for the World's Best Business Class, the World's Best First Class Lounge and the Best Airline in the Middle East. Called one of the world's most respected airline brands, number two carrier Singapore Airlines was cited for flying one of the youngest aircraft fleets in the world, offering high standards of care and service. It also won for Best Airline in Asia, the World's Best Business Class seat and the Best Premium Economy Onboard Catering. Number three on the list, Japan's ANA operates on 72 international routes and 115 domestic routes and is the largest operator of the Boeing 787. It also won for World's Best Airport Services and Best Airline Staff Service in Asia. While the Dubai-based Emirates dropped to number four in 2017, it did win World's Best Airline Inflight Entertainment and Best First Class Comfort Amenities. And number five, Cathay Pacific, won the top award in 2014 and has won it four times. Airlines have worked to step up their game when it comes to serving lucrative first-class customers and this was reflected by this year's winners for Best Airline First Class. 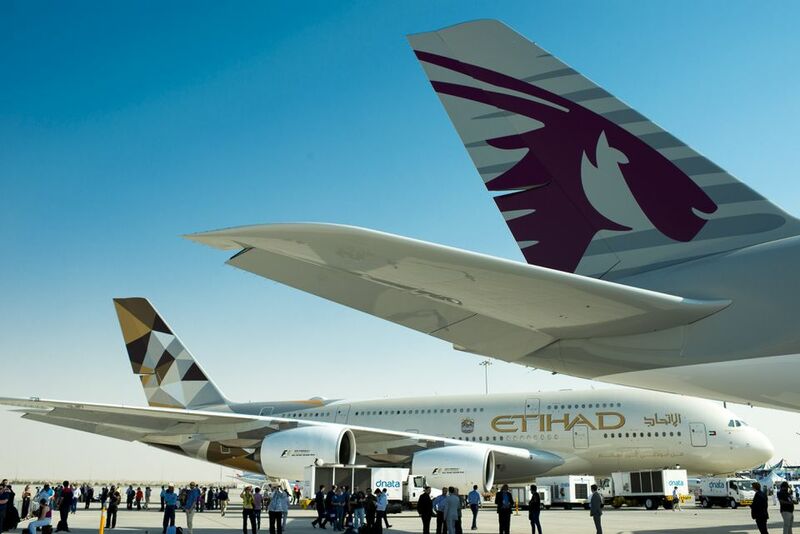 Number one was Abu Dhabi-based Etihad Airways, followed by Emirates, Lufthansa, Air France and Singapore Airlines. For economy class, the top airlines were Thai Airways, Qatar Airways, Asiana Garuda Indonesian and Singapore Airlines. Under the low-cost carrier category, voters chose AirAsia for the ninth year in a row, followed by Norwegian Air, JetBlue, EasyJet, Virgin America, Jetstar, AirAsia X, Azul, Southwest Airlines and Indigo. AirAsia also won for Best Low-Cost Airlines in Asia, while Norwegian won for the world's Best Long Haul Low-Cost Airline and the Best Low-Cost Airline in Europe. Skytrax offered awards to the World's Most Improved Airline, based on a carrier's quality improvement, including change within the global rating and performance improvements in many of the award categories over the past year. The top five in 2017 were Saudi Arabian Airlines, Iberia, Hainan Airlines, Ryanair and Ethiopian Airlines. Thai Airways for World's Best Airline Spa Facility. The World Airline Awards began in 1999 when Skytrax launched its first customer satisfaction survey. During its second year, it processed 2.2 million entries worldwide. Skytrax emphasizes that the World Airline Awards are done independently, with no outside sponsorship or external influence on the choices. Any airline is allowed to be nominated, which allows travelers to choose the winners. This year's awards were based on 19.87 million eligible survey entries from 105 nationalities taken between August 2016 and May 2017. It covered more than 325 airlines. Be sure to check out the complete list of the winners. What Are the Top 15 Airlines in North America? Which Airlines Were Safest in 2017? JADEC releases an annual list of the world's safest airlines for 2017.